Kangchenjunga, the highest mountain in India and the world’s third highest mountain stands at 8586m. It is known in part by its translation as the Five Treasures of the High Snow after its five peaks, three of which are on the border of northern Sikkim in India and Nepal, with the remaining two in the Taplejung District, Nepal. This mountain, originally judged to be the highest in the world until 1856, and sacred to the people of Sikkim, remained unclimbed after numerous attempts – including an attempt by the notorious Aleistair Crowley, known for his occult literature and rumoured to be a Satanist. In 1905 Crowley assembled a team consisting of Jacot-Guillarmod, Charles Adolphe Reymond, Alexis Pache, and Alcesti C. Rigo de Righi. However Crowley’s controversial approach split the group who all eventually rebelled against him and decided to turn back. Pache and several porters were killed later in an accident for which Crowley was largely seen as responsible for. Following a number of subsequent attempts, including two by German mountaineer Paul Bauer in 1929 and 1931, Kangchenjunga saw little activity until after World War Two, during which time the Himalaya’s became a strategic battle ground rather than mountaineering one. The 1955 Kangchenjunga expedition consisted of nine British team members, nine Sherpas and some three hundred labourers. 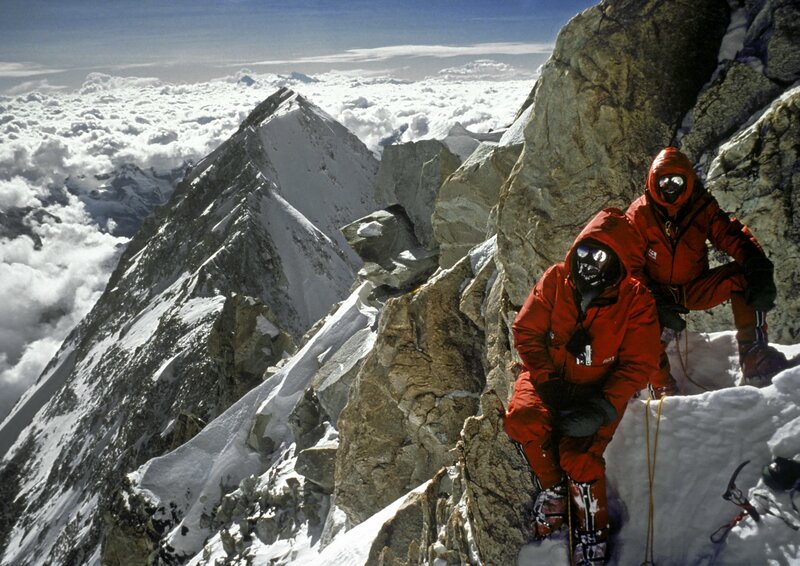 Two of the British team members had previously been on the 1953 successful expedition to Mount Everest. These two were Charles Evans and George Band. At the time the expedition was to take place, Kangchenjunga was the world’s highest unclimbed peak. Also in the team were Joe Brown, one of Britain’s best rock climbers, Norman Hardie, deputy leader of the expedition and Tony Streather, an English army officer. After starting out in April, Joe and George were the lead partnership left on the final summit push in May. Joe remembers the support team descending: “‘goodbye George. Cheerio Joe. Good luck!’” The support group turned to descend, leaving George and me alone on a small ledge 1,300ft below the summit”. On the 25th May 1955 Joe Brown and George Band stopped just short of the summit, honouring a promise to the Nepalese communities local beliefs that Kangchenjunga is a sacred dwelling place of their protective Gods. The following day Norman Hardie and Tony Streather also returned to camp 3 triumphant. They had also summited after finding a way around Joe Brown’s technical rock climb. The objective of the 1979 expedition to Kangchenjunga was to climb lightweight, as opposed the original ascent team’s military-style siege tactics. The expedition team consisted of Doug Scott, Georges Battembourg, Pete Boardman and Joe Tasker. During this ascent the team were forced to retreat to a snow cave several times due to severe weather conditions. Doug Scott however, felt compelled to try once again and reach the summit. Accompanied by Tasker and Boardman, they reached the summit of Kangchenjunga on the 16th May 1979, achieving the first ascent without supplementary oxygen and the third ascent of the mountain. As with previous ascents the team stayed a short distance from the summit as a sign of respect to the people of Sikkim.